Pictured are: Lorne Antle, project manager for UBC Properties Trust, Leanne Bilodeau, director of sustainability operations for the Okanagan campus, Warren, Shakespeare, and Shelly Thomson, Fortis energy solutions manager. The Okanagan campus qualified for more than $200,000 this year by taking advantage of electricity and natural gas rebates from utility supplier Fortis BC. 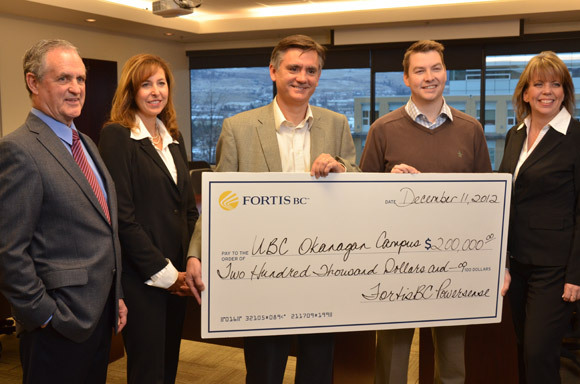 Mark Warren, director of customer service for Fortis BC in Kelowna was on campus to present a cheque representing the savings on December 11 to Michael Shakespeare, associate vice president administration and finance.